Previous incarnations of Cleveland/P&C/D&D have had an image thread, to handle political cartoons and other image-based stuff that doesn't belong in the general post-a-picture threads. If any of them spawn an extended discussion, please spawn it off into its own thread. Replies to non-picture replies should take the form of a link pointing to a post on a different discussion thread. And I shouldn't have to say it, but the images still need to abide by the rules. This should fill up naturally over time, so don't feel like you need to post a ton of pictures tonight. He's definitely putting that ketchup on his omelette. Get some Cholula sauce, you monster! I found out while having steak and eggs once that A1 is pretty good on eggs, as long as you don't put too much on. I like my eggs with avocado toast and millennial tears. The unintentional irony of that image is highly amusing. Yeah. A corporeal personification of the free market could knee Aetius in the groin and he’d still blame it on the government. I’ll keep saying it until it catches on: Libertarians are the Flat Earthers of politics. Take a closer look at the box in that picture. Okay, in spite of saying “enhance!” over and over to my phone I can’t tell if that flyer / box is actually Chinese. Even if it is, you have no idea if these garbage cans are in China. And even if they are it’s a hoot if you don’t think, functionally, China isn’t also a capitalist country right now. They’re a centralized government without functional democracy, but they still run a market economy that operates hand in glove with the system of neoliberal economics that organizes most of the planet. I can’t read the picture either, but it’s just semantics. If you want a better representation go to the back of nearly any grocery store or chain restaurant in the US outside business hours and peek in the garbage bins overflowing with still edible food from the previous day they had to throw out because their corporate masters forbid them from donating it or giving it away. Entirely anecdotal, but I briefly worked at a Barnes&Noble in 1999-2000. Like most, it had one of those miniature Starbucks cafes inside it. Everyday the cafe would dumpster an egregious amount of sandwiches, pastries, rolls, etc. Easily enough to feed 10-15 people on even a busy day. The official reasoning was that the cost of wasting the food was less important than potentially missing a sale due to lack of stock, and we couldn’t donate the wasted food because there would be no incentive for someone to purchase it if we did so. One of the clerks almost got fired for shoplifting one night for grabbing a couple of sandwiches out of the case after close even though they were minutes away from getting wasted. Why not sell the food at a steep discount a few hours before they get binned? Is there any reason not to do that? The capitalist perspective is that if you do that everyone will just wait to get the cheap food. So long as it's not sold at a loss, it's still profit. Moreover, you get good will and people get used to eating your food. When they have no time to wait around, they can buy your food knowing what they already like. It also stands to reason that if they're willing to wait, then everyone who is waiting isn't buying food from any nearby competitors, so it undercuts their sales for the entire waiting period, too. In this case I’m talking purely about grocers. I’m sure in the case of restaurants and prepared food there are regulations that make it hard to sell food close to the end of its life. Plus for some restaurants food would lose its feeling of “exclusivity” if you could get it the next day identically or something. I don’t know. We have 8 billion people on this planet and generate way too much carbon. So most of those excuses seem insane to me at this point. I worked at a bakery through high school and we made stuff that was served fresh (like within 30 minutes out of the oven) and what we didn't sell fresh we boxed up in to-go bundles that would keep for a couple of days. We would have to throw those bundles out at the end of the day but we did what you suggest Larry and at about 30 minutes before closing we would discount them to less than half price. We did have the occasional person that knew our process and would wait and come in at the end of the night to see what we had left, but it wasn't a frequent thing. Also the employees could take home whatever they wanted at the end of the day instead of trashing them. Yes, they could at least donate it to animal farmers or something. I think it is mostly a problem of coordination, if there was a business that went around at the end of the day and collected all of the food being thrown out and delivered it to a local pig farm I wonder if it would be successful enough. I'm not sure how much farm feed costs. I have seen shows that had something like this, I think there was a Dirty Jobs I want to say in Las Vegas that showed that is what some of the buffets did with a local animal farm. I think there was a Jamie Oliver episode that highlighted the same thing in Britain. And a government agent could shoot you in the gut and you'd still be blaming the market for selling him the bullet. 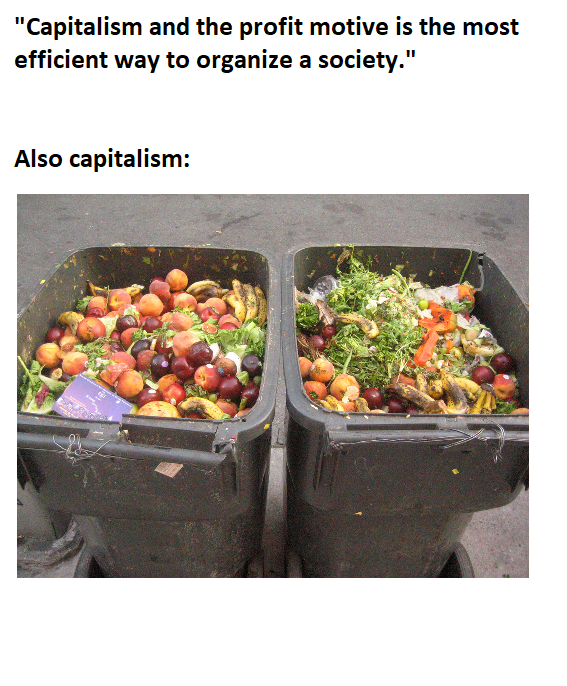 The irony is that it takes capitalism to be able to bin food like that. Every other economic structure we've tried has been subject to bouts of mass starvation after one or two bad harvests. Capitalism is so insanely efficient at food production that in market economies (which is most of the world now), the major food-related problems are obesity, food waste, and paying farmers not to farm in order to keep food from being cheaper. A second irony about the food waste issue is how the people who complain about it are exactly the people who won't accept anything but the best quality at restaurants. Serve me bread that was served before but not touched? Ick! Serve me bread that's been repurposed to croutons? Ewww! The danger with restaurant donations to the needy, Tilzer said, is that food given in good faith may become contaminated in handling. Potentially dangerous bacteria is ever-present in prepared foods and its growth can be retarded only through careful handling and strict attention to temperature controls, he said. Those who violate the law are subject to fines of up to $1,000 and six months in jail. Hundreds of citations are issued annually, usually to people who cook food at home and sell it on the street. Tilzer said he cannot recall any incident involving an illegal donation to the needy, but the county has made its position well known to restaurateurs. Few of Los Angeles County's 18,000 restaurants are able, or willing, to meet the legal requirements. Instead, establishments such as Gennaro's in Glendale or Spago on Sunset Boulevard simply discard leftovers. "Sure, we feel bad about throwing food away," said Frank Barrigan, owner of several restaurants and president of the Tri-City Area Restaurant Assn. representing restaurateurs in Glendale, Burbank and Pasadena. "But what are we to do?" Anyone going to risk six months in jail for donating food? Anyone? And if you think things have changed since 1988, think again - the latest trend in regulation is to make even food specifically cooked for the needy a criminal act, often by the same people complaining about food waste. That wasn't your usual gish gallop. You must be tired. Give him time. I’m sure that defending an ideology that threatens global social, economic, and environmental collapse is tiring. When I worked at the University of Michigan's Event Office, at the end of catered events these folks came and took all the leftovers. I believe the easiest thing they were legally allowed to do was make soup that had been kept at a high temp for long enough. Not sure if this is done/legal elsewhere. This was...1995 btw. You know why you had to go back to 1988 to find a government regulation story to support your view? Because the Bill Emerson Good Samaritan Act of 1996 has protected businesses that donate food from liability except in cases of gross negligence. The Federal Food Donation Act of 2008 goes even further and encourages federal agencies to donate excess food to nonprofit organizations. The biggest obstacle to getting donated food to needy individuals is currently city and state officials trying to over-enforce health regulations meant for restaurants on to people trying to distribute the donated food. a bit late, but the part about this that really jumps out is me is this: The company honestly beleives that the person receiving free food as some distribution point is the same person who can walk into Starbucks to spend $8 on a microwaved pinini. Hands on Wisconsin: Why are political cartoons disrespectful? People often wonder why I'm so critical of President Donald Trump. It's because he is so disrespectful to our nation and our founding principles. The official reasoning was that the cost of wasting the food was less important than potentially missing a sale due to lack of stock, and we couldn’t donate the wasted food because there would be no incentive for someone to purchase it if we did so. 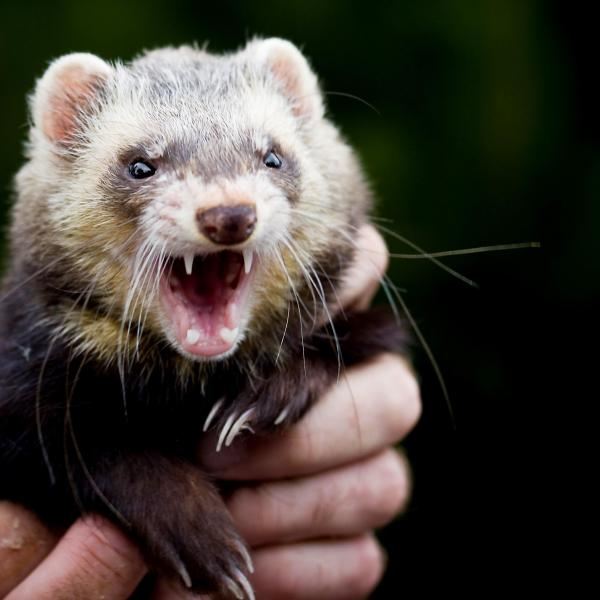 When my wife worked at Lowe's, whenever they discontinued a product (doors, toilets, shower enclosures), the remainders after clearance weren't donated but thrown away, and employees were directed to intentionally destroy them before putting them in dumpsters. They'd break things with axes and hammers so as to be unusable before sending them off to the landfill just so that no one who went through the trash might get a free door. f*cking government regulation, man. It's the worst. Are you sure it was regulation. At Walgreens, when we had to get rid of stuff we scanned it and got X% back from the manufacturer, then we had to throw it out. We had mark it so that no one would dig through the trash and try to return it. I worked at a grocery store where we would throw out expired milk, and it was the same. We had to bust them open so that we didn’t get customers returning expired milk. As for Lowe’s, the real answer would be donating that stuff to Habitat for Humanity. Government regulations keep us from donating unused product to those in need or allowing unused product to fall into the wrong hands. Free of oversight, corporations would care for all of us. The hardest working and brightest would rise to the top and benevolently care for those under them. There, I used a smiley face to indicate that I'm on your side and I'm happy to explain it to you. Sorry, Jay. I hope you got the bit. So government regulation IS actually a problem in this situation. However, those regulations WERE CRAFTED BY LOBBYISTS SO THAT PERFECTLY GOOD FOOD/GOODS ARE TOSSED OUT INSTEAD OF DONATED BECAUSE THE POOR ARE INFERIOR AND CONSUMERS WITHOUT CAPITAL ARE WORTHLESS TO CAPITALISM. f*cking magical thinking. The worse things get the less patience I have for it.